It's not everyday that I actually take a wonderful opportunity to undertake something that is both unforgettable and amazing at the same time.Â One instance I would mention as such an experience was the time I became a wrestling manager when I was still a sophomore at Sierra High School. It's not everyday that I actually take a wonderful opportunity to undertake something that is both unforgettable and amazing at the same time. One instance I would mention as such an experience was the time I became a wrestling manager when I was still a sophomore at Sierra High School. I was still the kind of person who would not like different people in my personal space and I was even shy to the point that I became easily intimidated by the appearance of strangers I would run into. Regardless, being wrestling manager brought down a lot of walls for me, and that is exactly what the Smithsonian trip did for me. As the first stop during the Smithsonian trip, I got to visit Boston, Massachusetts. I was completely enamored with Boston because it had a lively and welcoming atmosphere that made it feel like home. Sure the traffic was a little hectic at times and there were huge clusters of people in one setting the first time I arrived, but Boston was an unforgettable sight. The Faneuil Hall Marketplace was the biggest tourist attraction I had ever witnessed, the houses and buildings were made of a sophisticated and delicate architecture that was very old, and the Charles River looked very picturesque when I was still on the airplane that was preparing to land at the Logan Airport. When I was going to leave Boston for New York City, a part of me did not want to go since I had just seen how beautiful Boston was at night when I looked at the massive town from the breathtaking Skywalk. Inevitably, I had arrived in New York City after having the tour bus drive me and a considerable amount of people through Rhode Island and Connecticut. New York City was the kind of place that I had already familiarized myself with since I have seen shows like "Seinfeld" and movies like "Big" and "Home Alone 2." In other words, it was a renowned metropolis that needed no formal introduction since it consisted of a number of iconic figures and locations such as the Statue of Liberty, the Empire State Building, and of course, the glamorous Times Square. The traffic was even more hectic in the Big Apple and the atmosphere of the city was one of an urban and gritty type that I would imagine. Because I didn't pay much attention to the frantic feel of the Big Apple or the fact that it rained quite heavily, I was able to enjoy what the city had to offer. I took a small stroll through the Central Park, I got to be on the 82nd floor of the Empire State Building, I rode on a ferryboat to the Ellis Island museum where I got to see the Statue of Liberty, and last but not least, I got to see the Broadway musical of "Phantom of the Opera"! Interestingly enough, my third stop was Philadelphia, Pennsylvania. Philadelphia initially striked me as a mixture between Boston and New York City, except that this modern city had no chaotic traffic anywhere to be found and the city felt surprisingly simplistic compared to what I had visited so far. Nonetheless, it was a welcome change since I got to see a statue of Rocky Balboa and some of his cemented footprints and the Liberty Bell. Aside from seeing a bust of Benjamin Franklin along the subtle streets of Philadelphia and watching a presentation called "Freedom Rising" in a museum, there wasn't that much to see in the town as I had anticipated. And besides, I only got to see the city during one-quarter of the day before I had to leave for another significant location, but it was going to be Washington, D.C. Finally, the moment of truth had appeared when I was presented with a precious chance to experience Washington, D.C. for myself. I was already marveled by seeing what Boston and New York City had in store for me, but Washington, D.C. took it much further than I could possibly fathom. The cherry blossoms were lovely with how they bloomed during the spring, and that made visiting the District of Columbia so rewarding as a personal, special occasion. Within the four days I resided in the national capital of the U.S., I got to see Mount Vernon, the Lincoln Memorial, Ford’s Theatre, the Arlington Cemetery, the Jefferson Memorial, the Vietnam and Korean War Memorial, and last but not least, I got to see the Smithsonian museum of Natural History. 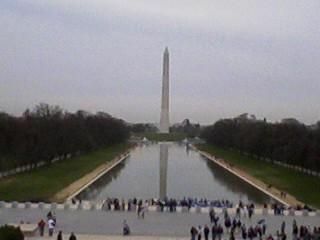 Unfortunately, I only got to see a little bit of the museum and the national capital as a whole, because the eighth day of the Smithsonian trip was going to be the day I would go back to Colorado Springs. But…To look at the bright side of things, at least I know that Washington, D.C. is a place that I would like to revisit sometime in the future. To make a long story short, the Smithsonian trip was a moving and astounding experience that I will never forget. Not even did I get to see a myriad of magnificent locations within four different states but I also got to meet people who came from Texas, Montana, and North Dakota as accompaniment over the course of this worthwhile trip. I have to admit, paying for the trip wasn't the easiest, but the strenuous effort that I put into earning the money was tantamount to the ultimate result of going on such a life-changing experience. Also, one of the two students that went on this trip beside myself and my AP U.S. History teacher, Ms. Cox, helped pay for the expedition on my behalf when I had just graduated early from high school back in December 2009. But anyhow…I am grateful that I have taken this wonderful opportunity to go on a spectacular adventure such as the Smithsonian trip; it had opened so much for me in terms of my horizons and my boundaries and I easily look forward to utilizing such amazing chances like this when I get older. Prev Article Prev Article Oh, The Places I’ve Gone!